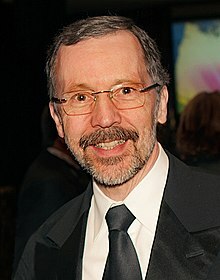 Edwin Earl "Ed" Catmull (born March 31, 1945) is an American computer scientist and former president of Pixar and Walt Disney Animation Studios. As a computer scientist, Catmull has contributed to many important developments in computer graphics. Edwin Catmull was born in Parkersburg, West Virginia. His family later moved to Utah, where Catmull's father first served as principal of Granite High School, then Taylorsville High School. Raised as a member of The Church of Jesus Christ of Latter Day Saints, Catmull was the oldest of five and as a young man served as a missionary to the New York City area in the 1960s. Early in life, Catmull found inspiration in Disney movies such as Peter Pan and Pinocchio and dreamed of becoming a feature film animator. He even made animation using flip-books. However, he assessed his chances realistically and decided that his talents lay elsewhere. Instead of pursuing a career in the movie industry, he used his talent in math and studied physics and computer science at the University of Utah. After graduating, he worked as a computer programmer at The Boeing Company in Seattle for a short period of time and also at the New York Institute of Technology, before returning to Utah to go to graduate school in fall of 1970. Back at the university, he became one of Ivan Sutherland's students and part of the university's ARPA program, sharing classes with Fred Parke, James H. Clark, John Warnock and Alan Kay. Catmull saw Sutherland's computer drawing program Sketchpad and the new field of computer graphics in general as a major fundament in the future of animation, combining his love for both technology and animation, and decided to be a part of the revolution from the beginning. From that point, his main goal and ambition was to make a computer-animated movie. During his time there, he made two new fundamental computer-graphics discoveries: texture mapping, and bicubic patches; and invented algorithms for spatial anti-aliasing and refining subdivision surfaces. He also independently discovered Z-buffering, even though it had already been described 8 months before by Wolfgang Straßer in his PhD thesis. In 1972, Catmull made his earliest contribution to the film industry: an animated version of his left hand which was eventually picked up by a Hollywood producer and incorporated in the 1976 movie Futureworld, the science-fiction sequel to the film Westworld and the first film to use 3D computer graphics. The sequence, known simply as A Computer Animated Hand, was selected for preservation in the National Film Registry of the Library of Congress in December 2011. 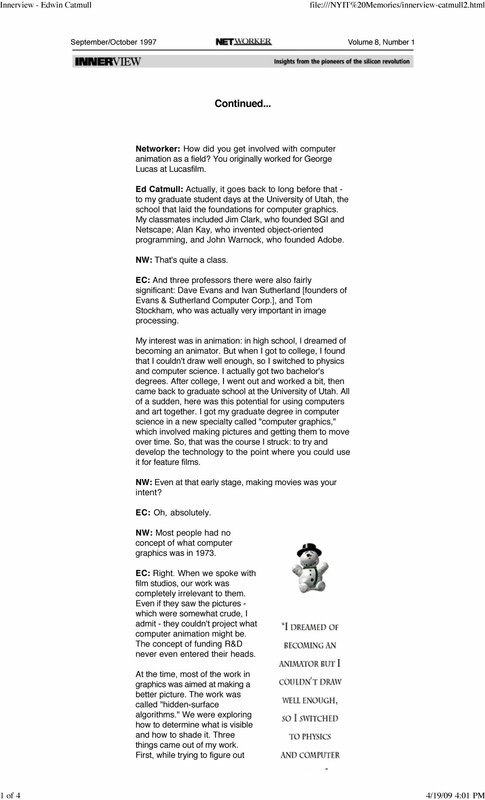 Lucas approached Catmull in 1979 and asked him to head up a group to bring computer graphics, video editing, and digital audio into the entertainment field. Lucas had already made a deal with a computer company called Triple-I, and asked them to create a digital model of an X-wing fighter from Star Wars, which they did. In 1979 Catmull became the Vice President at the seminal Industrial Light & Magic computer graphics division at Lucasfilm. At Lucasfilm, he helped develop digital image compositing technology used to combine multiple images in a convincing way. After Disney acquired Pixar in January 2006, Disney Chief Executive Bob Iger put Catmull and John Lasseter in charge of reinvigorating the Disney animation studios. According to a Los Angeles Times article, part of this effort was to allow directors more creative control as collaborators on their projects and to give them the creative freedom to use traditional animation techniques—a reversal of former CEO Michael Eisner's decision that Disney would do only digital animation, which Catmull thought was the wrong idea of how Pixar's films did well. In June 2007, Catmull and Lasseter were given control of Disneytoon Studios, a division of Disney Animation housed in a separate facility in Glendale. As president and chief creative officer, respectively, they have supervised three separate studios for Disney, each with its own production pipeline: Pixar, Disney Animation, and Disneytoon. While Disney Animation and Disneytoon are located in the Los Angeles area, Pixar is located over 350 miles (563 kilometers) northwest in the San Francisco Bay Area, where Catmull and Lasseter both live. Accordingly, they appointed a general manager for each studio to handle day-to-day affairs on their behalf, then began regularly commuting each week to both Pixar and Disney Animation and spending at least two days per week (usually Tuesdays and Wednesdays) at Disney Animation. In November 2014, the general managers of Disney Animation and Pixar were both promoted to president, but both continued to report to Catmull, who retained the title of president of Walt Disney and Pixar. On October 23, 2018, Catmull announced his plans to retire from Pixar and Disney Animation, staying on as an adviser through July 2019. In 1993, the Academy of Motion Picture Arts and Sciences presented Catmull with his first Academy Scientific and Technical Award "for the development of PhotoRealistic RenderMan software which produces images used in motion pictures from 3D computer descriptions of shape and appearance". He shared this award with Tom Porter. In 1995, he was inducted as a Fellow of the Association for Computing Machinery. Again in 1996, he received an Academy Scientific and Technical Award "for pioneering inventions in Digital Image Compositing". In 2001, he received an Oscar "for significant advancements to the field of motion picture rendering as exemplified in Pixar's RenderMan". In 2006, he was awarded with the IEEE John von Neumann Medal for pioneering contributions to the field of computer graphics in modeling, animation and rendering. At the 81st Academy Awards (2008, presented in February 2009), Catmull was awarded with the Gordon E. Sawyer Award, which honors "an individual in the motion picture industry whose technological contributions have brought credit to the industry". His book Creativity, Inc. was shortlisted for the Financial Times and Goldman Sachs Business Book of the Year Award (2014), and was a selection for Mark Zuckerberg book club in March 2015. ^ Catmull, E.; Clark, J. (1978). "Recursively generated B-spline surfaces on arbitrary topological meshes" (PDF). Computer-Aided Design. 10 (6): 350. doi:10.1016/0010-4485(78)90110-0. ^ Cook, R. L.; Carpenter, L.; Catmull, E. (1987). "The Reyes image rendering architecture" (PDF). ACM SIGGRAPH Computer Graphics. 21 (4): 95. doi:10.1145/37402.37414. Archived from the original (PDF) on 2016-03-04. Retrieved 2015-08-28.